Over 200 people gathered at Giggle Dam Dinner Theatre on April 11, 2019 to celebrate Port Coquitlam’s volunteers, laugh and mingle at the City’s annual volunteer awards night. Seven awards were handed out at the Port Coquitlam Volunteer Recognition Awards & Tribute evening, which featured entertainment from the Giggle Dam Dinner Theatre. The evening began with our keynote speaker Marco Pasqua, an engaging inspirational speaker, entrepreneur and accessibility consultant. A total of 28 people were nominated this year in the seven award categories, and all were invited to Thursday’s celebration along with other community volunteers. Fortis BC sponsored the event for the 21st year. 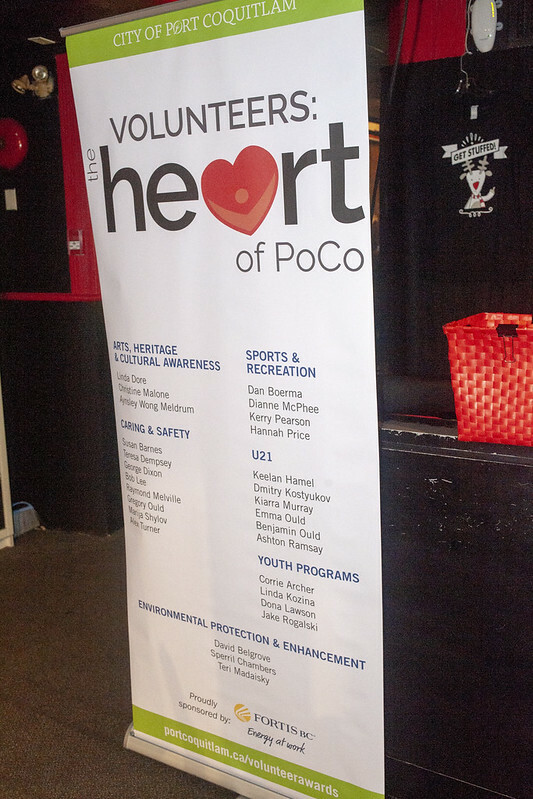 This year’s theme was Volunteers are the Heart of PoCo. Awards were presented in the following categories. Photos from the event are posted below. Lifetime Volunteer– Honours individuals who have dedicated many years to improving the community of Port Coquitlam through their volunteer efforts. She sets herself up as their uber grandmother – encouraging dozens and dozens of young people to new paths in their lives. Her nominator wrote that she is joyful, energetic, smart, determined and above all 100% dedicated to the lives of these youths at risk. They love her and they know who she is in their lives. Arts, Heritage and Cultural Awareness– Preserves and celebrates Port Coquitlam’s past and shares our community heritage with others; promotes the arts and cultural development of our community. Caring and Safety– Enhances and promotes the community through caring actions and outstanding acts of humanitarianism; contributes towards making Port Coquitlam a safer place for residents of all ages. Environmental Protection and Enhancement – Demonstrates an outstanding commitment to the promotion and preservation of Port Coquitlam’s natural environment for present and future generations. Sports and Recreation –Enhances the quality of physical activity in Port Coquitlam; contributes to the management and/or operations of a sports or recreation activity; demonstrates outstanding dedication to Port Coquitlam’s sports and recreation community. Youth Programs – An individual who supports Port Coquitlam’s youth through the development, provision and/or participation in youth programs and activities (excluding amateur athletics). U21(Youth Under 21)– Reserved for the recognition of a Port Coquitlam youth, under the age of 21, who has demonstrated a commitment to our community and has made extraordinary volunteer contributions in any of the categories above. Although volunteers work selflessly, it’s encouraging to be recognized for your hard work and sacrifice. All eligible nominees receive special treatment. All nominees receive a commemorative pin, certificate, and two tickets to a special tribute evening in April with fun, food and entertainment. All recipients also receive a personalized award and are added to the Volunteer Honour Roll at City Hall. Preserves and celebrates Port Coquitlam’s past and shares our community heritage with others and/or promotes the arts and cultural development of our community. Enhances and promotes the community through caring actions and outstanding acts of humanitarianism; contributes towards making Port Coquitlam a safer place for residents of all ages. Demonstrates an outstanding commitment to the promotion and preservation of Port Coquitlam’s natural environment for present and future generations. Enhances the quality of physical activity in Port Coquitlam; contributes to the management and/or operations of a sports or recreation activity; demonstrates outstanding dedication to Port Coquitlam’s sports and recreation community. An individual who supports Port Coquitlam’s youth through the development, provision and/or participation in youth programs and activities (excluding amateur athletics). Reserved for the recognition of a Port Coquitlam youth, under the age of 21, who has demonstrated a commitment to our community and has made extraordinary volunteer contributions in any of the categories above. Nominees in the six other categories may also be considered for the Lifetime Volunteer award, which recognizes an individual who has dedicated many years to improving the community through their volunteer service in any area. Ongoing professional assistance from a rental apartment energy management expert to guide owners/managers through the process of making a wide range of energy upgrades.